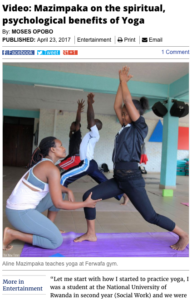 Rwanda’s leading newspaper The New Times interviewed yoga teacher Aline Mazimpaka about teaching yoga, she shares lots of information about classes in Kigali with Yego Yoga and beyond! 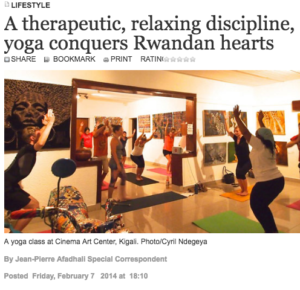 Local celebrity Makeda did a feature on Yoga in Rwanda with a little demo (yes Makeda did yoga!) 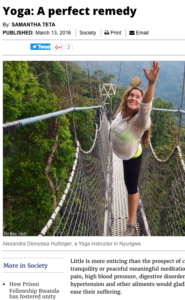 and interviews with Yego Yoga co-founder and instructor Allie Huttinger and the ever-energetic Joseph Dushimimana, founder and instructor of Holistic Fitness Rwanda. “Let me start with how I started to practice yoga, I was a student at the National University of Rwanda in second year (Social Work) and we were studying relaxation techniques when the lecturer, an American woman mentioned yoga among the relaxation techniques. It was the first time I understood what yoga is all about,” explains Mazimpaka Aline, one of the few certified yoga instructors in the country. 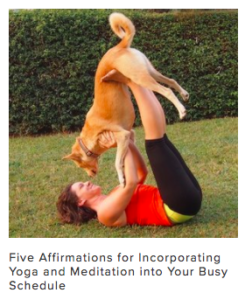 “Anyone can do yoga because it is really diverse and anyone can find what suits them. I have taught yoga from children to adults, overweight to underweight people, men and women. My oldest student was 87 years old and so Yoga is definitely for everyone who is curious, desires change and wants to be the best versions of themselves,” Allie says. 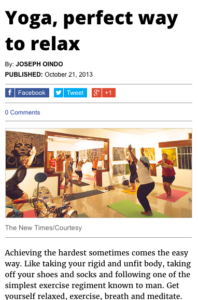 The article features comments from Yego Yoga’s Allie, and also from Kigali yogis Michael Gasana and Brina Miles.